You might not believe me now, but there is going to be a time in your not-so-distant future when you are sick of Thanksgiving leftovers. You won’t be able to imagine eating another turkey sandwich, but you’ll still have a giant plate of the stuff kicking around your fridge. 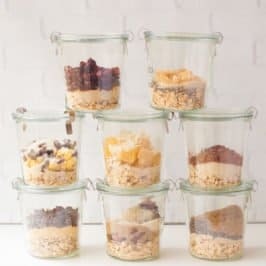 What’s a non-food-wasting, frugal person to do? 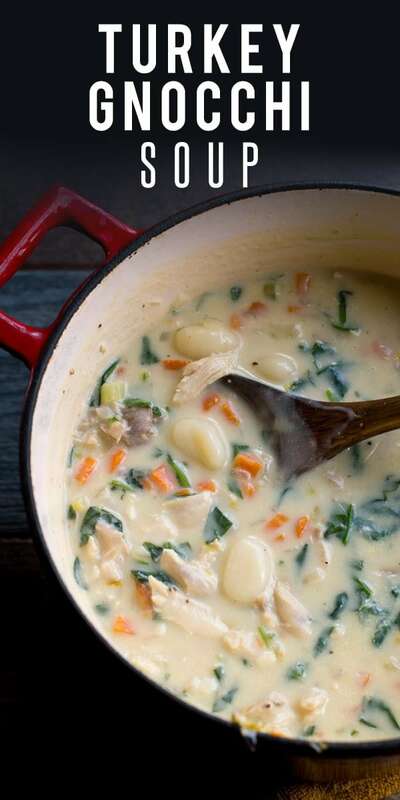 Make this turkey gnocchi soup. That’s what you’re going to do. And you’re going to promise me right now. Because this is one of the best soups (if not the best) that I have ever posted on this little chunk of internet real estate. I thought I wasn’t going to be able to top the Slow Cooker Cheeseburger Potato Soup, but holy guacamole, this one is right up there, too. I can’t claim credit for this deliciousness though. This recipe is a big shout out to my Mama. 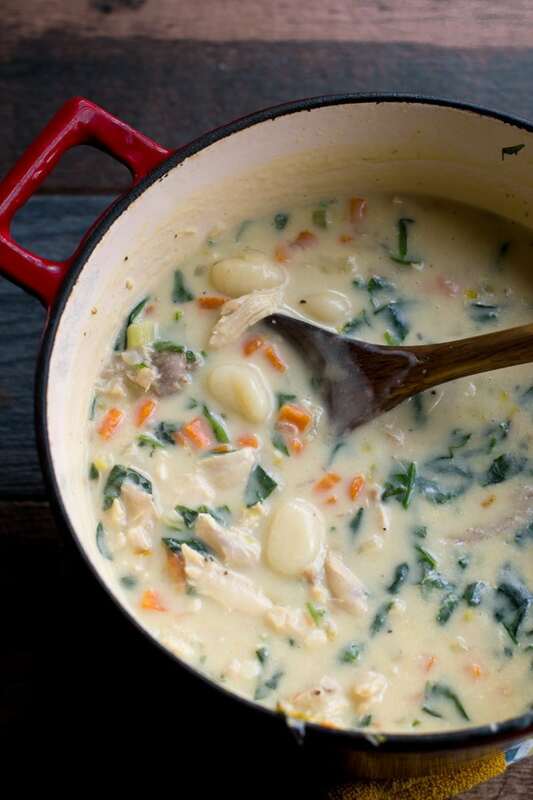 She first served our family Chicken Gnocchi Soup about a year ago—and it was amazing. Like eat three bowls and then have to waddle home kind of amazing. And I’ve continued to make the chicken version of this soup throughout the cold months ever since. But I had an inkling that the recipe would be killer as a way to use up leftover turkey, and boy, was I ever right! Of course, you could easily take the recipe as written below and sub in chicken (a rotisserie chicken would be great!) 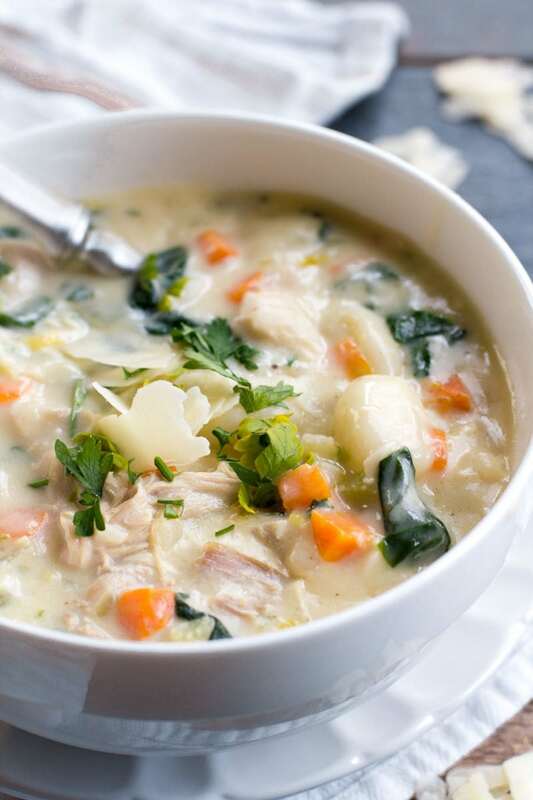 and be along your merry way, but there is something about the slow-roasted, rich flavor of a Thanksgiving turkey (combined with good quality turkey stock made from the leftover bones) that really take this soup to the next level. It’s even better if you happen to have meat and stock from a smoked turkey, but just a run-of-the-mill roasted turkey will be darn good, too. My Mama originally got the recipe from Reeni over at Cinnamon Spice & Everything Nice. Mama did some tweaking on it and sent it over to me. And then I did some more tweaking on it and am now giving it to you. 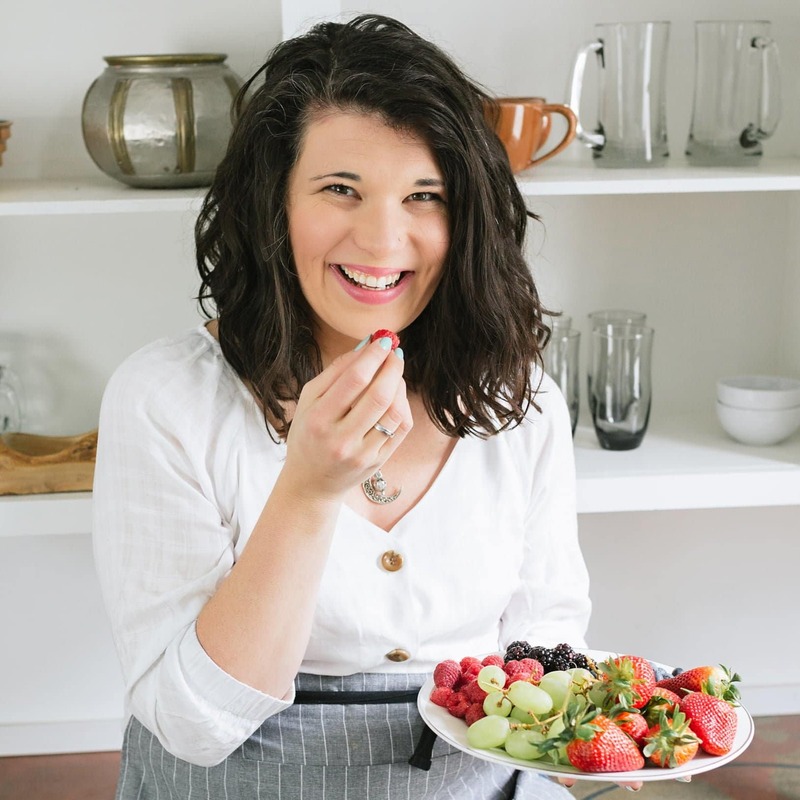 Reeni’s original version is really wonderful, but you know me, I can’t leave well enough alone when it comes to a recipe. My version is touch less rich and a little bit more simple. I really am super lazy in the kitchen, so whenever I can skip steps, I am all over that! One step I don’t skip—making my own turkey stock. I’m not against the canned or boxed stuff, but if you have a perfectly wonderful turkey carcass just lounging around after Thanksgiving dinner, please make that beauty into some stock. 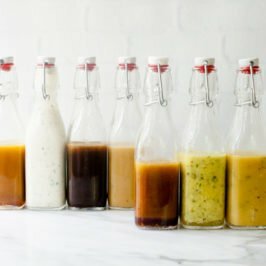 Since my turkey roasting recipe (more about that here) calls for all kinds of aromatic veggies and herbs, all I do after I’ve taken the meat off my turkey is to toss the drippings, veggies, herbs, and carcass into a big stock pot, cover it with water, and let it boil down until it tastes rich. It’s almost no work at all. And the flavor? Oh, the flavor! And you can use it in place of chicken stock in all of your favorite recipes. Like this soup. Trust me. I know this is going to become a favorite. I hope you all have just the most wonderful of Thanksgivings! I’m going to take a few days off to really bask in this season of gratitude, but I’ll be back on Sunday with the kick-off of a super fun week of holiday-themed posts. I can’t wait to share with you what I’ve been working on! I really am so thankful for each and every one of you. Thank you for building me up, supporting me, and building a wonderful community of like-minded friends that I can constantly count on. Seriously, you all rock. Happy Thanksgiving! 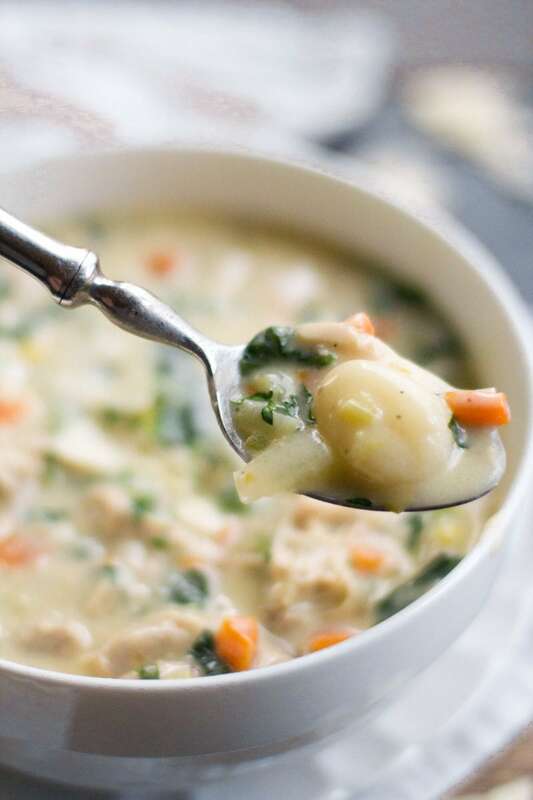 Creamy, cozy, and comforting, this Turkey Gnocchi Soup is a perfect way to use up Thanksgiving leftovers. Sub in chicken if you finished off the turkey! Adapted from Cinnamon Spice and Everything Nice. Melt the butter in a large stock pot over medium-high heat. Add in the red pepper flakes and garlic, and cook until just fragrant, about two minutes. Add in the onion, carrots, and celery. Cook until all veggies are tender, about 5 minutes. Sprinkle the flour over the veggies, and stir to coat. Add in the broth, bring to a boil, then add the gnocchi. Reduce heat and simmer, stirring frequently, until the sauce is thickened and the gnocchi are cooked, about 10 minutes. Stir in the cream, turkey meat, nutmeg, salt and pepper, and spinach. Return to a simmer, and continue to cook until the spinach is wilted and the soup is warmed through. Test for seasoning. Serve topped with fresh grated Parmesan. Don’t have turkey? No problem. Use chicken broth and cooked chicken meat (from a rotisserie chicken is great) in place of the turkey. P.S. 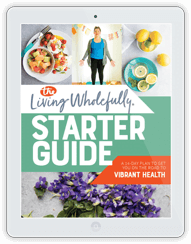 If you haven’t signed up to receive emails from Wholefully yet, now is a great time to do it! 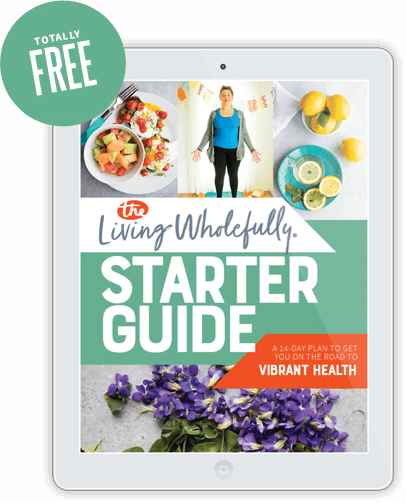 I just launched a FREE (totally free!) holiday eCookbook that has 18 of my favorite Christmas cookies in it. To get it, all you have to do is sign up to receive emails (no spam, and you can unsubscribe at anytime) and then confirm your subscription—the download link will come directly to your inbox. The eCookbook is only available for a limited time, so make sure to sign up now! Happy holidays! I made this for my extended family with our Thanksgiving turkey leftovers, and it was delicious! It was a huge hit. I loved it so much that I have already made it again but with chicken. 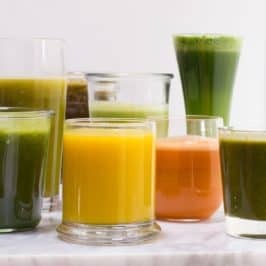 can I substitute a 10 oz box of frozen spinach for the fresh spinach? Sure can! Just make sure to defrost, drain, and squeeze dry first before adding. 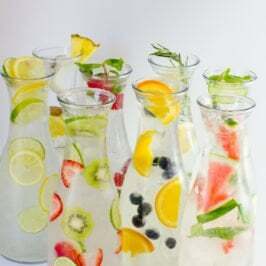 This will be the perfect way to get rid of those turkey leftovers! 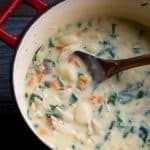 I am always looking for more soup ideas! I made this today with oúr leftovers from Thanksgiving it was delish! Thanks for posting. Looks delicious. Taste great. I’m just starting to make more soups, I think this will be a favorite. Made this tonight and I must say it is a keeper!!!! 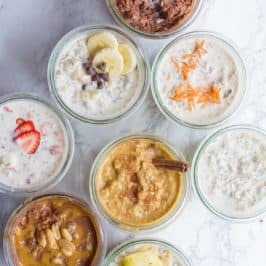 Can I use milk instead of cream? And kale instead of spinach? Sure, it’ll just be thinner, and kale doesn’t wilt the same way spinach does, so it’ll retain some of it’s chew! I made this last night and it was a huge hit. 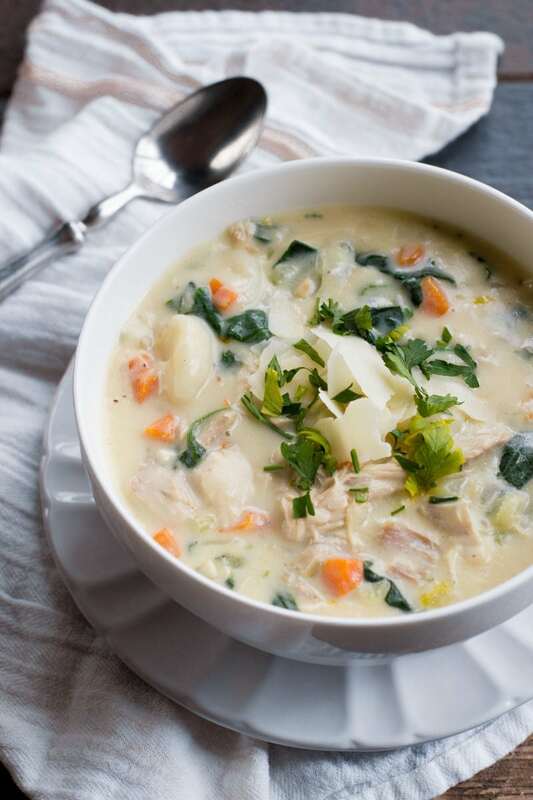 Very filling and a perfect comforting, winter soup. I might try finding one more layer of flavor to add. Maybe an herb or roasting the garlic rather than sauteing it? This was super good! And I even used almond milk (2 cups, actually) in place of the half & half, and thickened it with cornstarch instead!